If someone were to blurb your blog in 25 word or less, what would he or she say? On her eponymous blog, Rhiannon Hart discusses YA fantasy, dystopian and paranormal books (mostly) from a writer's/reader's POV, and tracks her efforts to get published. What kinds of books do you read and review on your blog? Books that I loved, and that I think I have something to say about. I usually don't finish books I'm not enjoying, and if I can't think of something exciting/quirky/new to say about a book, I won't post about it. Because most of my books come from the library I'm not on the cutting edge of reviewing, but there are too many wonderful books published in the last 200 years to just ignore them. And that's not even counting Shakespeare or Homer. Often the books I love have a strong female protagonist, so you'll see a gender bias amongst my reviews! And Lud save us from insipid heroines. What were a couple of your favorite books recently and which ones are you most looking forward to reading soon? Recently I loved Life as We Knew It, Susan Beth Pfeffer, The Death of Grass, John Christopher, Obernewtyn, Isobelle Carmody (reread). I'm looking forward to The Knife of Never Letting Go, Patrick Ness, Graceling, Kristen Cashore and Magic Study by Maria V. Snyder. They're all sitting in a pile on my floor, with a dozen or so more books that I can't wait to get to. What are some of your favorite posts or reviews in your blog archive and why? My review of Day of the Triffids by John Wyndham. This isn't his best book but its an interesting read as far as gender roles in the event of an apocalypse are concerned, much like The Death of Grass by John Christopher. What are some posts or reviews on other blogs that have caught your attention as being well worth reading? Anything at Underage Reading. Emily and Elizabeth don't just post reviews, but also whimsical analyses of books, like their Books I felt I ought to have liked but really didn’t: The Phantom Tollbooth post. Anything at Angieville. Angie reviews lots and lots of fantasy books, especially ones she feels are under-appreciated by the fantasy community. I especially enjoyed the post which put Megan Whalen Turner on my To Read list (and lots of other people's lists too). ...I'd be boring my friends to death talking about the fantastic books they should read! 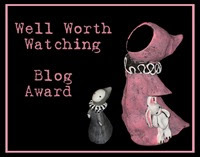 The Well Worth Watching Award was created and designed by Joanne of The Book Zombie. I'm just passing it along to other bloggers! I love getting to know bloggers better. Thanks for this feature. I like Rhiannon's review policy. I review every book I read (it's a challenge I'm in this year). It's been tough, but I've even reviewed DNF books, as long as I got far enough a long to say something intelligent. I like finding new bloggers. I like her review policy because she reviews what she reads. I like that. Thanks so much for this feature, Lenore! This is a fun way to be introduced to bloggers...enjoyed it immensely!! Excellent choice -- I love Rhiannon's blog too! Also: What a fantastic feature! this sounds like an excellent blog. thanks for bringing it to our attention.